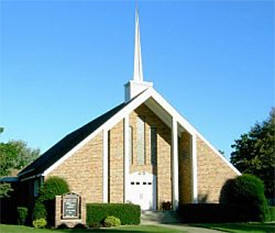 Lake City has a population of 5,339 and is located on the western border of 21-mile long Lake Pepin, the widest spot on the Mississippi River. 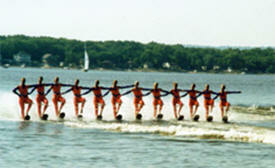 Renowned as the “Birthplace of Water Skiing”, it was here that Ralph Samuelson invented the sport of water-skiing in 1922. Considered one of the best sailing lakes in the nation, Lake Pepin is also prized for excellent water activities of all kinds. 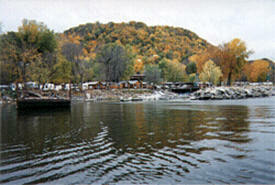 Lake City is home to the largest small-craft municipal harbor on the Mississippi River, and has over 600 boat slips. The area is known for its spectacular scenic views and is a haven for tourists looking for excellent fishing, sailing, golfing, birding, bicycling, snowmobiling, hiking and many other activities. Large concentrations of bald eagles and an abundance of migratory birds have earned Lake Pepin the designation of a Globally Important Bird Area. 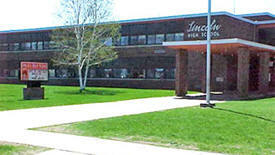 Lake City is located approximately 15 miles south of Red Wing, 35 miles north-east of Rochester, 45 miles north of Winona, and 65 miles south of Minneapolis/St. Paul. Lake City is a city in Goodhue and Wabasha counties in the state of Minnesota. 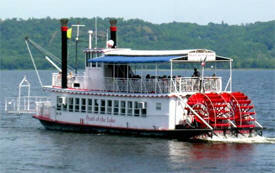 It lies along Lake Pepin, a wide portion of the Mississippi River. 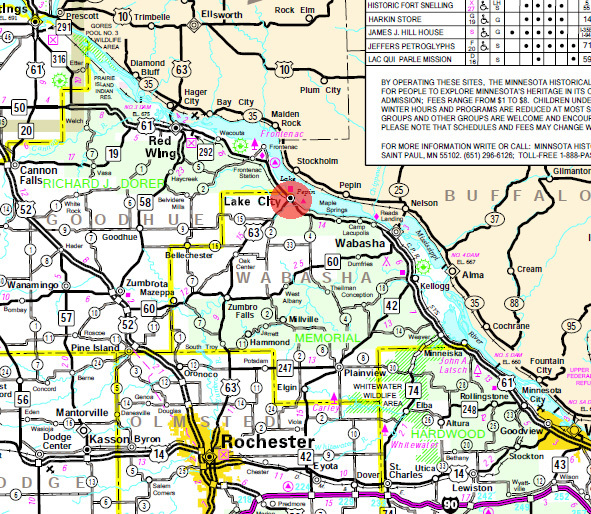 Most of Lake City lies in Wabasha County, with only a small portion of in Goodhue County. U.S. Highways 61 and 63 are two of the main routes in the community. According to the United States Census Bureau, the city has a total area of 4.56 square miles (11.81 km2); 4.50 square miles (11.65 km2) is land and 0.06 square miles (0.16 km2) is water. The elevation is 696 ft (212 m) above sea level. As of the census of 2010, there were 5,063 people, 2,238 households, and 1,428 families residing in the city. The population density was 1,125.1 inhabitants per square mile (434.4/km2). There were 2,687 housing units at an average density of 597.1 per square mile (230.5/km2). The racial makeup of the city was 95.3% White, 0.5% African American, 0.3% Native American, 0.8% Asian, 1.3% from other races, and 1.7% from two or more races. Hispanic or Latino of any race were 3.2% of the population. There were 2,238 households of which 24.4% had children under the age of 18 living with them, 51.3% were married couples living together, 8.3% had a female householder with no husband present, 4.2% had a male householder with no wife present, and 36.2% were non-families. 30.6% of all households were made up of individuals and 15% had someone living alone who was 65 years of age or older. The average household size was 2.20 and the average family size was 2.72. The median age in the city was 46.2 years. 20.2% of residents were under the age of 18; 6.7% were between the ages of 18 and 24; 21.8% were from 25 to 44; 27.7% were from 45 to 64; and 23.7% were 65 years of age or older. The gender makeup of the city was 48.1% male and 51.9% female. 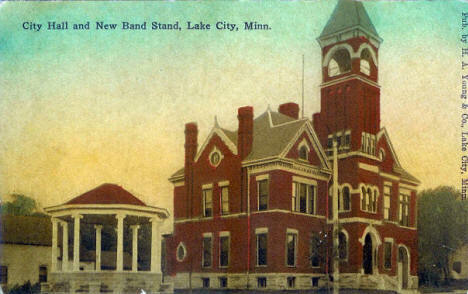 The city of Lake City is located 65 miles (105 km) southeast of the Twin Cities at the intersection of U.S. Highways 61 and 63 on the Mississippi River at Lake Pepin. Lac de Pleurs (Lake of Tears) was the name given to Lake Pepin by Father Louis Hennepin, who camped on the shore of the lake in 1680. He christened the large body of water Lac de Pleurs after observing his Sioux captors weeping near the lake over the death of a chief's son. The war party of Isanti Sioux had captured Hennepin and his two companions several miles south along the Mississippi and were camping near the lake on their return north to their Sioux villages near present-day Mille Lacs. The first known settler was Jacob Boody, who arrived in 1853. In the years to follow, several explorers passed through this area. The town was platted in 1855. The town supervisors were given special powers by the State Legislature in 1864 to create a port market for grain. 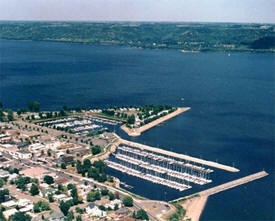 At Lake City the waters of Lake Pepin were deep enough to allow for such a port. Soon the town became noted as a profitable market with the volume of trade for the year 1866 bringing in a little over a million and a half dollars. 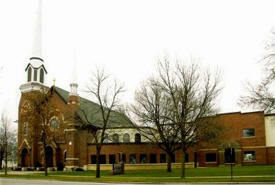 The city of Lake City became incorporated in 1872 and since has continued to thrive in its location on beautiful Lake Pepin. 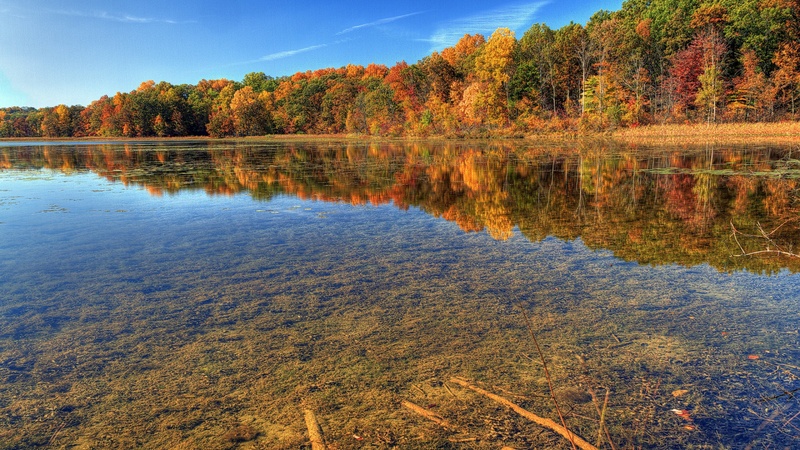 It is widely known for its attractive surroundings and bountiful fishing for every fresh water species. 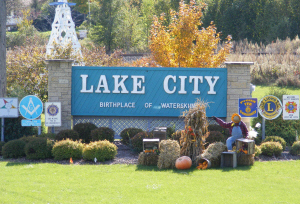 Lake City was the home of the inventor of waterskiing, Ralph Samuelson, and is thus known as "The Birthplace of Waterskiing." The Sea Wing disaster occurred on July 13, 1890 when a strong squall line overturned the excursion vessel Sea Wing on Lake Pepin near Lake City. Over 200 people were aboard the vessel when it was overturned, and as a result 98 people drowned. LAKE Township, beside Lake Pepin, was first settled in 1853-54; the village of Lake City was platted in 1856; and on May 13, 1858, this township was "named Lake City by a vote of the people." 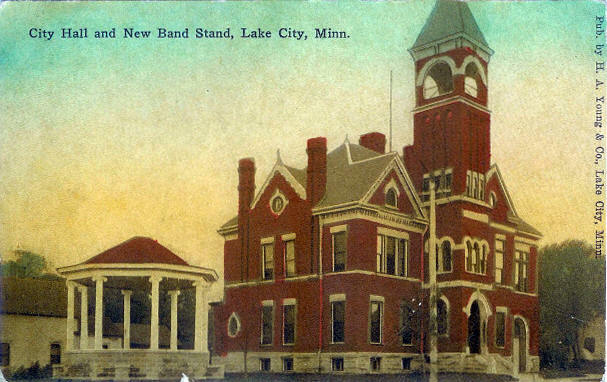 The city was incorporated February 26, 1872, and the remaining part of the township "one year thereafter received by legislative enactment the curtailed name of 'Lake,' as it now is" (History of Winona and Wabasha Counties, p. 796). 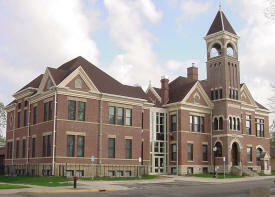 The city, governed with Goodhue County, was incorporated as a village in 1909; the post office was established in 1856 in Harvey F. Williamson's general store; the village had a station of the Chicago, Milwaukee and St. Paul Railroad. Lake City's annual event held the last weekend in June event, draws more than 20,000 visitors, and is in honor of Ralph W. Samuelson who invented the sport of water-skiing on Lake Pepin in 1922. There are numerous activities that are part of Water Ski Days including: music, crafts, carnival rides, a classic car show, beer garden, volleyball tournament, food vendors, and of course a water-ski show. Come join us in our celebration! The event is a celebration of Lake City's local apple economy, and abundant fall harvest of apples. The festival is held near the peak of the spectacular fall foliage, making Lake City a great fall destination. 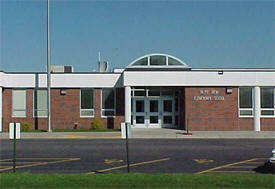 Events include: arts and craft fair, book sale, farmers market, games, apple pie and bake sale, and silent auction. The orchards in the Lake City area produce about one-fourth of the 700,000 bushels of apples grown in Minnesota each year. The Lake City area, including Pepin Heights orchard is the nation's largest producer of the Haralson variety of apple. 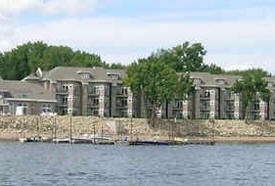 The municipally owned and operated Lake City Marina is the largest small-craft municipal harbor on the upper Mississippi. It contains space for 600 pleasure craft. Provides electricity and water on all docks; shower facilities; overnight guest dockage; launching ramp; public beach; gasoline sales; nighttime security and a Yacht Club on premises. A newly constructed administration building was recently opened to the public. Seasonal mobile home park is adjacent. A variety of fish are caught from the nearby breakwater and pier. For enthusiastic walkers, joggers and rollerbladers a scenic walkway begins at the north end of the city and runs parallel to the marina ending in Roschen Park to the south. The “Pearl of the Lake” is an authentic replica of the magnificent river boats which traveled the Mississippi River in the early 1900’s. She has a full service bar on board and catered meals are available. Book your wedding, family reunion, or private party now! Public excursions are available Wednesday through Sunday at 1 pm. Please call for reservations, leave your phone number so we can let you know if we need to cancel in case of high winds, storms or private charters. 1870 brick Italianate four-room schoolhouse with Wabasha County history displays including restored school room; clamming, early river transportation, American Indian artifacts, military and household artifacts. A pole shed filled with antique farm machinery. 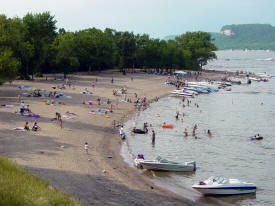 Hok-Si-La Park is a 252 acre city park located on the Minnesota side of Lake Pepin. 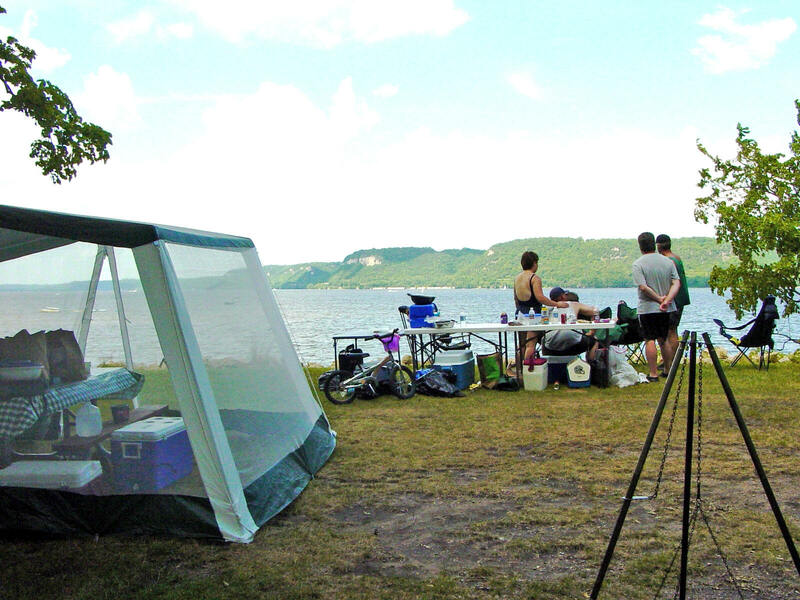 Treat yourself and you’re guest to a great view from the events/dining facility, experience tent camping at its best, launch the boat at our ramp and swim in Lake Pepin. Take time to explore our mile of Mississippi River shore, check out the interpretive center, take the kids to the playground, play volleyball or basketball, enjoy a picnic or relax at the chapel. Park buildings and camping are open mid April through mid October. Park is open year round for an outing with your family, hiking, bird watching or a stroll on the beach. Winter offers groomed cross-country ski trails. 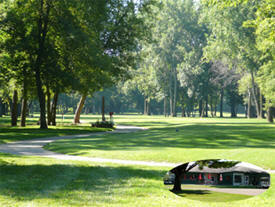 Lake City Golf Club is a beautiful, challenging 18 hole golf course open to the public. It has been open since 1928. In July of 2000 we expanded to 18 challenging golf holes designed by Gill Miller Inc. that feature 9 new water hazards in addition to a meandering stream running through the finishing 3 holes that are a true test for even the most avid golfer. Only 4 holes are remaining from the old course. Spectacular panoramic view over beautiful Lake Pepin. Our spacious deck comfortably seats 32 people. 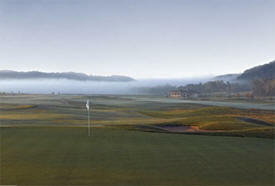 Our first four greens rest on the bluff's edge, allowing a breathtaking view as you golf. 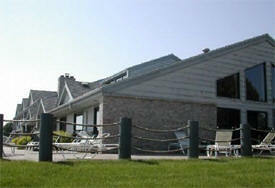 Our facility can accommodate receptions and golf outings. Cart rentals, practice green, driving range, full service bar. 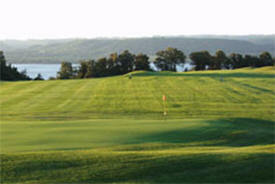 12 of our 18 holes overlook beautiful Lake Pepin. 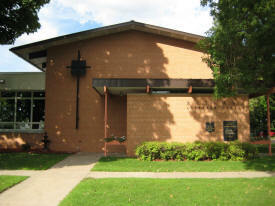 The main campus in Lake City consists of a clinic, a hospital and a 90-bed nursing home. The facilities are attached, providing easy access to services for patients and nursing home residents. 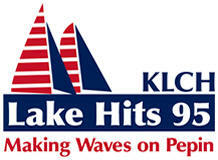 As of June 2006, Lake City Medical Center also has 3 off campus clinics located in Alma, WI, Plainview, and Wabasha, Minn.
KLCH-FM 94.9 - "Lake Hits 95"
This charming 1890 Victorian home features four unique and very beautifully appointed guest rooms all with private baths. Throughout the home you will find a fun mix of antiques, interesting decor and whimsical frogs and bears. There is a stocked butler’s pantry and high speed internet available to guests 24 hours a day. Beautiful Lake Pepin, the widest spot on the Mississippi River, is just a short walk from The Frog & Bear. In the morning, a sumptuous full breakfast is served. 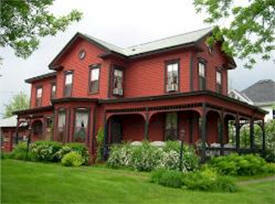 1865 Victorian offers full breakfast buffet and Twilight Wine and Hors D'oeuvres. Walk to downtown shops, Lake Pepin and Mississippi River. A 2 1/2 Mile River Walk, marina, paddlewheel boat rides, sailing, seven golf courses, hiking, birding, year round fishing and festivals, and casino nearby. In Winter, ski, snowmobile and Bald Eagle viewing. 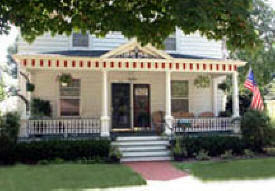 The AmericInn overlooks beautiful Lake Pepin which is a natural widening in the Mississippi River. Enjoy our enhanced continental breakfast, indoor pool, whirlpool and sauna. You will also find plenty of outdoor fun in Lake City, including: golfing, boating, sailing, nature trails, downhill and cross-country ski, ice fishing, snowmobiling, and eagle watching. Restaurants and shops are all within blocks of the motel. Motel new remodeled rooms! One and two bedroom, full kitchen units available. Super clean rooms with basic single & double rooms. Plenty of boat parking with fish cleaning house available. Most economical motel in Lake City. Camp Lacupolis, the most beautiful fishing spot right here in the upper Midwest. Nestled among the hills and woods on the banks of lower Lake Pepin on the Mississippi River. Camp Lacupolis is an enchanting little village of log cabins, complete with kitchens, bathrooms, and air conditioning. You can launch your boat, dock in the protected harbor, enjoy catching fish near the main channel and in the quiet bays and backwaters, or just relax, enjoy the spectacular view of the majestic Mississippi River, and let your soul sing. 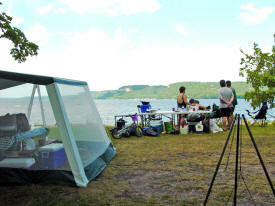 Prime campsites located above the lake offer campers a spectacular view of Lake Pepin. Make reservations early for these sites, as they tend to book up early. Drinking water is available and spigots are located throughout the campground. Modern bathrooms and showers are near the swimming area. Hiking trails meander throughout the park and are open for year around public use. Hok-Si-La has 34 regular sites and 8 group sites. Group sites can accommodate 5 to 10 tents (family, friends, youth groups and clubs find the group sites meet all their needs). 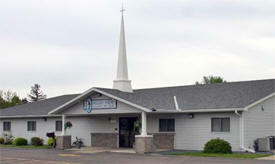 Across the road from beautiful Lake Pepin, 1 mile N of Hwy 61 & 63, River walk to town. Full hook up with 50amp, playground, basketball court.